The space race that took hold of the historical imagination in the mid-to-late 20thcentury amidst the fresh and turbulent memory of war is represented in the historical consciousness of the modern age, in names such as Sputnik, Explorerand Apollo. These names are immediately familiar not only to the experts, but to millions of laymen and TV audiences that have experienced them in countless films, comic strips, cartoons, science programs and even on the evening news. There are other names too: For example that of the first astronaut, when the Sputnik II was launched by Russia in November 1957, with the first space passenger, a female dog nicknamed Laika, name by which the world still remembers her. Over the following years, several countries issued postage stamps in memory of Laika: Romania, Poland, Mongolia, Hungary, among others. As late as 2007, Bosnia-Herzegovina issued a postage stamp commemorating the 50th year of her historic space flight. A simple search on ‘Lebanon’ and ‘rockets’ in any library or search engine would produce all predictable results: Hezbollah, Israel, war, destruction and more war. Archives in Lebanon produced but little results, and the question for the artists here was: How could this happen? 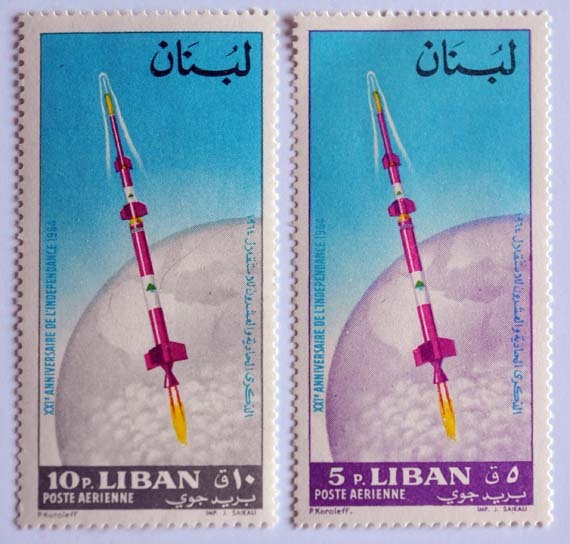 How such a grandiose story, of the first rocket of the Arab world once commemorated with a postage stamp, disappear from historical memory? Disappearing objects nevertheless are not a foreign territory in the work of Hadjithomas and Joreige: “This is also what we have focused on in our research: Referents that cannot be located.”3 In the 1960’s, the Lebanese Rocket Society, a space project from Lebanon, began at the Haigazian Armenian University in Beirut, under the direction of mathematician Manoug Manougian. He and his students launched rockets – eight of them – with the dream of exploring space. In 1967 the project was stopped and quickly forgotten. 1967 was an unexceptional, or rather unexceptional year in Arab and Lebanese history, setting the conditions for what would become the long Lebanese Civil War – that perhaps really has not ended – and that would bring to an end the golden years of Lebanon. What Samir Kassir called the ‘laboratory of modernity’ was officially aborted and Hadjithomas notes that “this was a traumatic moment in which we inherited a moment of disenchantment.”4 The artist questions the notion of an aborted modernity by saying that “I don’t think that we are any more modern today than, say, back then. I think we had a different perception of ourselves.”5 This coincides with Kassir’s assessment that the disappointment with and of modernity in the Arab world is not a product of modernity but of the collapse of modernity. Here one could add however, that disappointment is part of the intense irony of modernity about itself and part of its survival mechanism. How is it possible then that an adventure like the Lebanese Rocket Society did not leave traces in the present? Joreige explains in an interview that it is because it doesn’t fit into the current imaginary of Lebanon, cruelly tainted by war. “We’re product of a situation”, he explains, adding that this background noise of war and conflict is not only a background but a full ground, against which we are subject to a political production of reality. The research for this project – at present consisting of various installations, photography, different artistic interventions and the documentary film “Lebanese Rocket Society: The Strange Tale of the Lebanese Space Race” – led them to people who were involved in the project and ultimately to Manougian, living in the United States and who surprisingly had everything: Documents, photography, film. But the film isn’t simply a historical documentary: There is an incisive intervention on the part of the artists. Hadjithomas and Joreige present in their film a tale – no less strange than that of the Lebanese space race – as a tribute to dreamers, to those Lebanese, Armenian immigrants fleeing from persecution and death and that found themselves at home in Lebanon, at home enough to look up and dream of outer space without military aims. The artist’s realized dreams was creating a scale-size sculpture of the once famous Cedar IV, and bring it to Haigazian University, where the Lebanese dream of conquering space started once. To subvert and transform the meaning of the rocket, clean from violence and war and for the purpose of science and progress:“…Create a rocket that looks like a missile and say, this is not a weapon, this is the fruit of what we once were, of what we can still be today: Researchers, Utopians, Dreamers.” Navigating through the impossible Lebanese bureaucracy, in which rockets have only negative associations, building it, transporting it. Indeed a dream. “In the preface to The Crisis of Culture, Hannah Arendt defines the notion of breach as the moment of rupture in which man, caught between past and future is compelled to project himself into an uncertain future, and therefore into the possibility of starting something new, of inventing himself in uncertainty.”7 For Arendt, the main idea is to envision the past not as the past, the narrative, the tradition, but as the continuity of memory that allows man to find his place in the world no matter how hostile and confusing. How to move in the world when the elements of judgment afforded by traditional histories are absent? “The thread of tradition is broken, and we must discover the past for ourselves – that is, read its authors as though nobody had ever read them before.”8 Opening the vaults of this curious project was not about idealizing a past already vanished and archived, but to re-enact it in such a way that the message would be: Objects in history may appear closer than they seem. 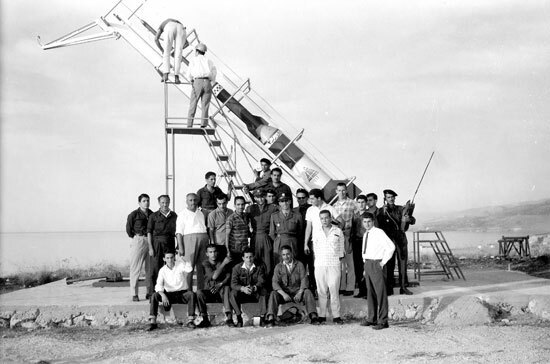 Already in 1962, the members of the Lebanese Rocket Society installed at the tip of the rocket transmitters broadcasting the message “Long Live Lebanon!” on the waves of Lebanese radio after the launching of their rockets. Similar to the messages launched in space missions on golden records with sounds intended to offer a glimpse of life in our planet. The first probes of sound will arrive closer to any celestial body in 40000 years. 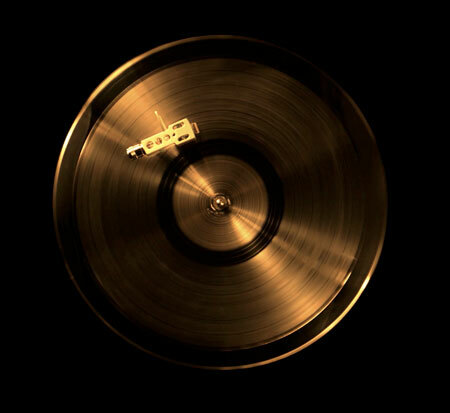 Similarly, “The Golden Record” from the Lebanese Rocket Society is an installation with an engraved soundtrack that attempts to reproduce sounds from the 1960’s, in another dream… What if the Lebanese had sent their rockets far into space in the 1960’s? What probes would have they sent? One is here reminded of an extract from the official communique of President Carter, installed in the Voyager: “This is a present from a small, distant world, a token of our sounds, our science, our images, our music, our thoughts and our feelings. We are attempting to survive our time so we may live into yours”. And how hard is Lebanon trying to survive, to survive war and malaise, to survive occupation, to survive itself above all. But if I may return to Hannah Arendt briefly, I think the input of the 20th century thinker for this mesmerizing project and film stands not just at the margin of being able to move between past and future – enacting the present – but with the powers of the imagination. For Arendt, in her rather strange reading of Kant’s Third Critique, the imagination appears are one of the most important activities connected with the faculty of judgment because, “to think with an enlarged mentality means that one trains one’s imagination to go visiting.”9 For Arendt, imagination and its result, the enlarged mentality, is the political quality which enables one to take a step back and distance himself from his own life in order to wear someone else’s shoes; to ask the question, what would I do if I were in shoes other than mine own? The utopian dream of Hadjithomas and Joreige isn’t simply a fantasy but the establishment of the possibility of a political reality – farfetched as it might seem – in which we produce the full ground of our experiences rather than being subject to the background noise of violence and war. Theologian Philip Goodchild suggests that utopia isn’t merely an aspiration, but adds: “We shall also suggest that politics, rather than consisting purely in a convention for extending sympathies and harmonizing interests, may be founded on a third, utopian sphere, where truth appears once more as the ground of vividness and imagination”.10 The utopian isn’t an enemy of reality but rather an integral element of its configuration. And perhaps this is what happened to this impossible state and its impossible dream to reach for outer space: The problem is not that Lebanon imagined too much, but that too quickly it stopped dreaming. The final message of “Lebanese Rocket Society: The Strange Tale of the Lebanese Space Race” may be: Our crisis is a crisis of the imagination. Here is the Chinese ecological devastation of the most serious idiosyncratic of the regions, gusting ambiance as a replacement quest of the shape of loam and deforestation behavior is taking increasingly poker-faced, resulting in a large precinct of ? ?soil grinding, desertification sight intensified, generative pollute class clothed to be increasingly marginal.